Openbox theme Blocks by addy-dclxvi THANKS! (:. Tint2, conky-std, compton & DeaDBeeF. GTK2/3 Theme Qogir based on Arc gtk theme horst3180. Fonts Iosevka. Cheap thrills, that desktop was a fun little project! +10 would recommend. That's great to see that KDE can be made to play nice with Openbox and not mess it up. Looks great and theme fits in with the general BL look. Maybe a good unofficial thread on how to set up KDE (while keeping the original Openbox setup reasonably intact) on BL would be nice to have. Maybe a good unofficial thread on how to set up KDE (while keeping the original Openbox setup reasonably intact) on BL would be nice to have. Oooh, no can do, amigo. I'd still recommend running the full kde-desktop install and leave openbox on another partition, it minimizes conflicts and it cuts down on libraries, which are small individually but add up when you have one for qt and another for gtk. Plus, Plasma 5.13 is still only available on sid. If it hits testing and more people want to use it, we could start a thread. For now, your thread in BL & General Linux Help is good enough. 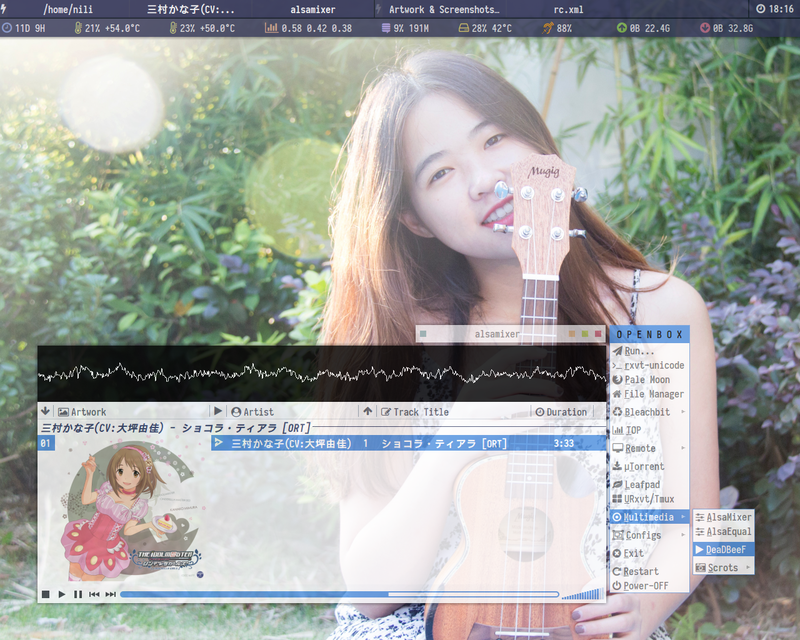 I can adapt the OB and GTK2 themes but struggling with GTK3. The Bunsen helium themes are based on the Xubuntu theme Greybird, so the gtk-3.0 css is generated from the sass files via the parse-sass.sh script, which means you edit the sass file (_colors.scss in this case) and then run the script. It also means you have to install sass, which is a bit of a pain. It's all packaged and in the debian repos, but it took me awhile to get the right packages and dependencies installed and I didn't take notes. I haven't installed it on this sid partition yet, I'll take notes this time! Easiest solution, edit a theme that doesn't use sass, there are plenty of those. Heck, the hydrogen themes might work, maybe not. Anyway, I did a dark one to match Breeze-Dark, I'll upload it and post a scrot and link later. I forgot, this is on my to-do list. Use the KDE theme Breeze-Dark in /usr/share/themes. It uses a single gtk.css file for GTK3. Edit selected bakground and forground colors, done. There are both gtk-3.18 and -3.20 folders, .20 should be enough, edit both for good measure. Many thanks for the information - much appreciated. I'm using the Archlabs Dark theme which I've modified slightly. The only changes I wanted to make were to the in-application menus so that I can change the highlight background and test colours on drop down menus. Managed it fine with the GTK2 file but I'm failing to grasp where these changes are made for GTK3. I'm pretty new to this so much studying is the order of the day! Hanging out with i3wm while on my travel laptop...probably going to swap to i3 full time when I am back on board. ^ I can see why, that looks great. Cheers man. It's not too different from my OB setup. The openbox and xfce4-notify themes haven't been customized yet, which is why I've renamed them *.bak If you use Firefox, see the theme's ReadMe for the input-field hack. I'll look at posting the KDE theme hack I've made that matches, stay tuned. @robo, I'll need you to verify these instructions. Rename colors to colors.orig, then copy/paste colors.custom and rename it colors ... Now you have a backup named colors.custom in case the Debian theme package gets updated/overwritten and a copy of the original theme file. Sounds good @hhh, that sounds good if I want to do a KDE setup and keeping OB around as a backup WM in case KDE gets trashed on some upgrade in Sid which can happen fairly often as KDE Plasma is still being heavily developed. Sorry to hijack this thread BTW. No worries, this thread is also for general Linux setup discussion. -edit- BTW, now that this minimal Plasma setup is all configured, it's flipping fantastic. Looks great and as close to BL as possible, so I may take the plunge back into KDE now that that DE has become more solid since the terrible 4.x days. Heck, wish there would be an *unofficial* KDE respin of BL much like how ArchLabs became an unofficial respin of BL but on an ArchLinux base. ^ RAM usage is ~170-200M more than BL Openbox, and the login time is slower, and it's on sid. Still fantastic, +10 would recommend. Definitely worth it on a newer machine while KDE may struggle on an older one (where a light WM like Openbox shines). Perhaps when Lithium is released might be a good time to see if a KDE respin or even a setup script offered that installs/sets up KDE. Looks good - nice work with the polybar; i3 or i3-gaps? using jgmenu instead of openbox root menu, or launched from tint2. i3-gaps, I'm not quite sure I understand the need for the gaps so when I am back on my main PC I'll probably use just plain old i3wm. It's an aesthetics thing. I use gaps with spectrwm, but didn't like them using i3 containers. I thought as much. Just seems such a waste of screen space. I have my gaps set to 3px.